US President Donald Trump’s close ally and lawyer Rudy Giuliani spoke of “revolution” and the “overthrow” of Iran’s ruling clerics at a rally of anti-government Iranian Americans on Saturday as the administration continues its offensive against Tehran. 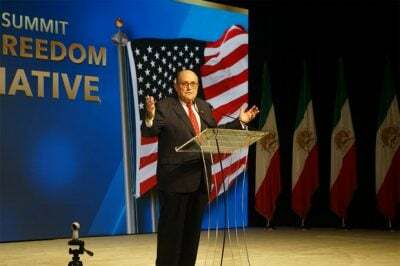 Giuliani spoke at the so-called 2018 Iran Uprising Summit in midtown Manhattan, hosted by the National Council of Resistance of Iran (NCRI) – an umbrella bloc of opposition groups in exile that seeks an end to clerical rule in Iran – and the Mojahedin-e Khalq (MEK), an anti-government Iranian religious group that used to be on the US terror list. “I don’t know when we’re going to overthrow them. It could be in a few days, months, a couple of years, but it’s going to happen. They’re going to be overthrown, the people of Iran have obviously had enough,” Giuliani told a cheering crowd. The end of Iran’s 39-year-old clerical establishment would not echo the chaos that followed the US-led invasion of Iraq in 2003, thanks to the NCRI and Iran’s multi-skilled diaspora, Giuliani said in a 15-minute address. The rally came after the Trump administration pulled out of the 2015 nuclear deal with Iran in May and is ratcheting up sanctions which, officials say, are aimed at deterring Tehran’s military expansionism rather than topple its government. ‘Time for the mullahs ending’? But some Iranian Americans see parallels to the build-up to the invasion of Iraq, and say that links between the Trump administration and the NCRI, which presents itself as an Iranian government-in-waiting, are worrying. That is not least because of NCRI’s president-elect Maryam Rajavi, who also heads the highly controversial MEK, which has a background in leftist, Islamist-style violence and fosters cult-like devotion among its followers. “Iran is in a critical moment, with the continued protests in Iran. The time for the mullahs is ending. It is also time for the world to recognize the legitimate demands of the Iranian people for a free republic based on the separation of religion and state,” Rajavi said. In a recorded video message, she urged the US and the UN to sanction and pressure Iran, while laying out plans to tackle poverty, improve human rights and hold free elections in Iran within six months of the mullahs being toppled. Rajavi and Giuliani addressed and roused the crowd at the New York Sheraton, backed by Iranian rock and classical music and other speeches from former US Gen James Jones and France’s former foreign minister Bernard Kouchner. They made no mention of an attack on a military parade of Revolutionary Guard troops and officials in the southwestern Iranian city of Ahvaz on Saturday, in which at least 25 people were killed. Iranian leaders said US-backed Gulf states were behind the killings. Trump supporters have spoken at NCRI events in the past, including National Security Adviser John Bolton, who, before taking his post, told the group’s members they would be ruling Iran before 2019 and their goal should be regime change. This week, Trump is expected to heap more pressure on Iran in his speech before the UN General Assembly on Tuesday and at a Security Council meeting focused on Iran and illegals weapons flows on Thursday. Iran has seen its rial plunge, economic turmoil and a wave of protests that has spread to 80 cities since December as US sanctions bite and additional curbs are expected to shrink Iran’s oil exports when they are imposed in November. Ali Safavi, a card-carrying member of NCRI, said his group usually only holds a street rally during the UN’s annual meet of world leaders, but had raised its profile this year as US pressure is seeing the clerics’ grip on power weaken. “The mullahs are on their last legs,” Safavi told Middle East Eye. Echoing Rajavi, he called for action by the UN and emphasized the secular, democratic credentials of the MEK, also known as the People’s Mujahideen Organisation of Iran (PMOI). The MEK has an odd backstory. Its members joined the 1979 Islamic revolution but later broke from the ruling clerics. Based in Iraq since the early 1980s, their fighters clashed with US forces during the 2003 Iraq war, but have since renounced violence. Many of its members remain stranded in Iraq as the group fell out of Baghdad’s favour after Saddam Hussein’s downfall. The European Union had the MEK on its list of banned “terrorist” organizations from 2002-09. The US classified the MEK as terrorists until 2012. Rajavi and her husband, Massoud, run the group though the latter’s whereabouts are unknown. A 2009 report by the RAND Corporation noted how MEK members had to swear “an oath of devotion to the Rajavis”. Researchers also described the MEK’s “authoritarian, cultic practices,” including “mandatory divorce and celibacy” for the group’s members and how devotion to the Rajavis replaced “love for spouses and family”. Speaking with MEE outside the Sheraton, Sam Garshasp, an Iranian-American student who travelled from Michigan to attend the rally, referred to the strict membership rules he was ordered to follow. “You have to be so straight, no play around, no joking. There are special rules, I’m not allowed to say it,” said Garshasp, who asked for his surname to be changed so other members would not be able to identify him. The 21-year-old has lived in the US for five years. He wishes to see an end to clerical rule and backs Trump’s sanctions despite the hardship faced by relatives back home. He only backs the MEK with reservations. “Are they going to make it better? And will they have our back? They have to start doing something so people can trust them and support them,” Garshasp told MEE. The group has faced other criticisms. In 2011, a Christian Science Monitor investigation into the big hitters from across the political spectrum who speak at MEK events revealed some were paid tens of thousands of dollars to stump for the group. The most recent public opinion survey commissioned by the Public Affairs Alliance of Iranian Americans (PAAIA), a research and lobby group, showed how 402 Iranian-American respondents held less-favourable views of Rajavi than other Iranian political figures. Only 7 percent of respondents had favourable views of Rajavi. That was similar to the 6 percent who felt positive about supreme leader Ali Khamenei, but much lower than the 55 percent who backed President Hassan Rouhani. Only 1 percent of respondents backed Iran’s cleric-run system, while 8 percent wanted it reformed. Most Iranian Americans (55 percent) favoured a secular democratic government and 11 percent sought the return of a Shah-like monarch. 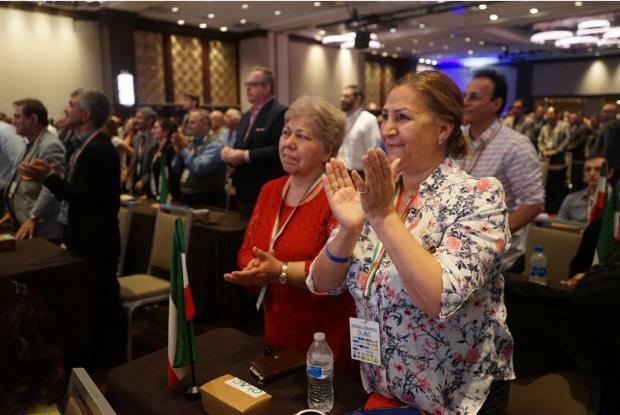 “The people of Iran despise the MEK,” Roxana Ganji, a California-based Iranian-American pro-democracy activist who has long called for the downfall of the mullahs but questions the MEK’s democratic and ethical credentials. “By Giuliani and Bolton going there for speaking engagements and getting paid for it and being part of Mr Trump’s administration … gives people the idea that were going to replace a terrorist government with one that’s even worse,” Ganji told MEE. Featured image is from James Reinl/MEE.